Halama Farms tends to each coffee tree as an individual plant, and each is carefully pruned and harvested by hand. 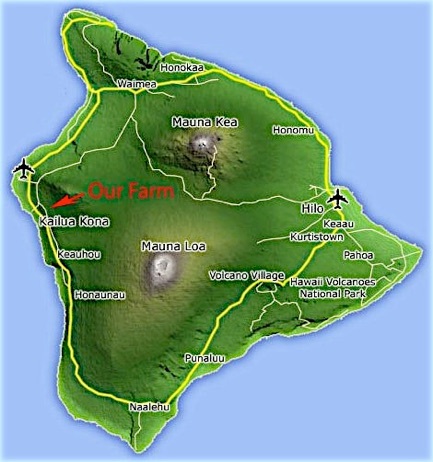 Halama Farms is located on the slopes of Mount Hualalai, a volcano which rises above the Kona coast on the Big Island. 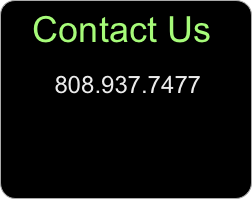 We are about three miles east (up slope) of Kailua-Kona and five miles north of the village of Holualoa, which is known principally for its artistic flavor. 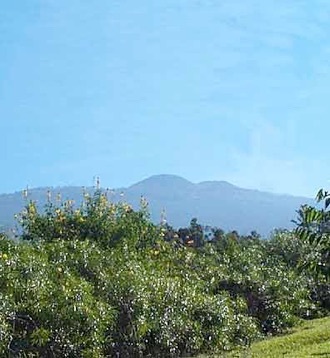 The peak of Mount Hualalai, the volcanic mountain on which we live, is a little over 8000 feet in elevation and protects the Kona coast from wind and rough weather. Our farm's elevation ranges from about 1,450 feet to about 1,700 feet, providing us a robust growing season. The combination of elevation, afternoon cloud cover, abundant rainfall, protection from winds, good drainage, and nutrient-rich soil permits us to grow our wonderful coffee. Halama Farms coffee trees are tended by hand. We use tools for pruning, but we approach each coffee tree as an individual plant, and each is carefully pruned and harvested by hand. This is not true of all coffee -- some coffee trees, even on other Hawaiian islands, are tended by mechanical means only. 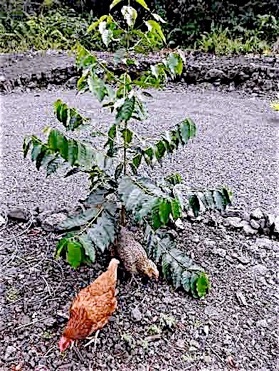 Most Kona coffee farms are 5 acres or less in size. 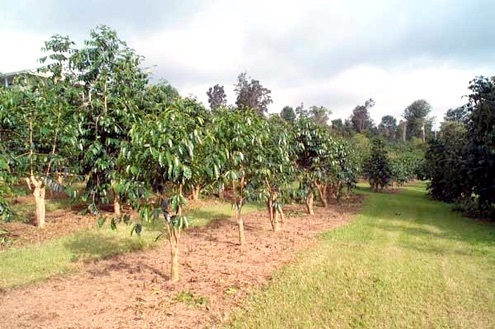 Halama Farms has about 4 acres planted in coffee and about 1,000 trees. 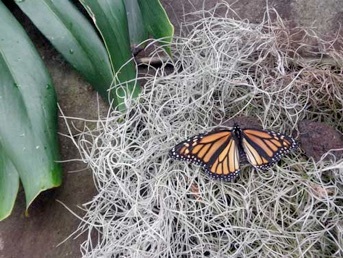 Our trees are pesticide-free. 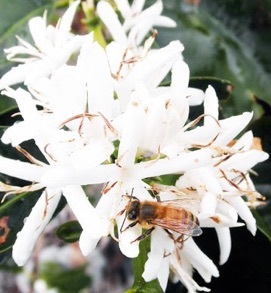 We also have bees and a few young cacao plants. Our cherry coffee is larger than average, and that means our beans are also larger -- and more flavorful -- than many. Halama Farms sells only estate-grown coffee (that is, we sell only coffee grown on our farm -- we do not supplement our small supply of coffee with beans from other farms) in order to maintain our high standards of quality. Because we are a small farm, we do not sort our coffee into fancy, extra fancy, and peaberry. This means that extra-rich peaberry beans may be found in each bag of Halama Farms coffee. We usually roast Halama Farms coffee to a medium dark stage. We feel that this stage brings out the best flavor in our beans. If you have a large order (say, 20 pounds or more), we may be able to do a custom roast for you (medium, medium dark, or dark roast). Typically we ship whole bean coffee, but for a custom order, you may choose whether to have ground or whole bean coffee. Halama Farms has been a finalist in the Kona Coffee Cupping Contest. 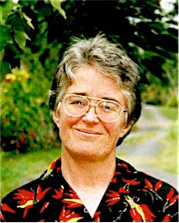 We are also proud to be the exclusive supplier of 100% Kona coffee to Mrs. Barry's Kona Cookies (www.konacookies.com) and to provide coffee for the Silver Oaks Ranch B&B (www.silveroaksranch.com). Halama Farms is owned and operated by refugees from Silicon Valley who moved to Hawaii in 1997. We have learned about the coffee business through the advice of agricultural experts, longtime local growers, and simply by growing the coffee ourselves. We hope you will enjoy our coffee as much as we enjoy growing it! Our chickens constitute our pest control program.